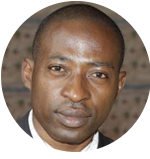 Aboubakar Mounchili is a Yaounde based video journalist and TV programs presenter. A graduate of the Yaoundé Institute of Sciences of Information and Communication, Aboubakar has reported extensively for various international media in many countries accross the world. He is now editor in Chief at Africa media TV and works from its Yaounde Bureau.